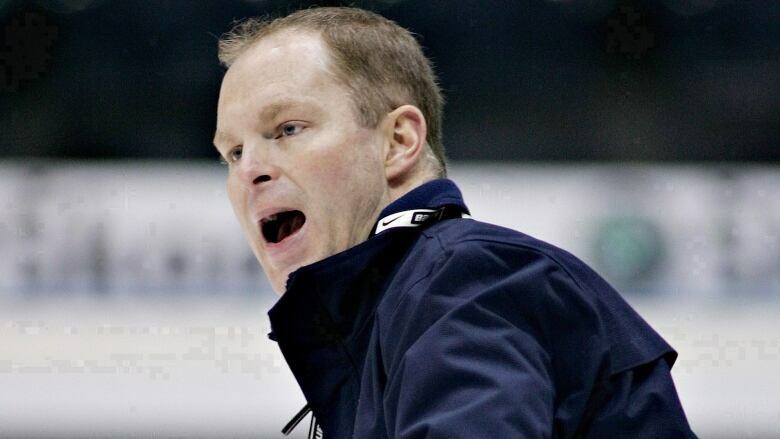 John Hynes has been hired as coach of the New Jersey Devils, becoming the youngest coach in the NHL at 40 years old. John Hynes was hired Tuesday as coach of the New Jersey Devils, becoming the youngest coach in the NHL at 40 years old. General manager Ray Shero said under Hynes, the Devils will be a fast, attacking team that knows how to play defence. Nobody but Hynes was offered the job, Shero said. Financial terms of the multi-year contract were not disclosed. In conducting his month-long search, Shero said he wanted a coach who could teach, inspire and have discipline. He never had a big list of candidates and when he decided on Hynes, it felt right. "I think John embodies all of that stuff and he has a presence," said Shero, who was the Penguins general manager when Hynes was hired to coach at Wilkes-Barre/Scranton of the AHL, the Penguins' top farm team. "I have seen him in development camps. He has a presence and he is a leader," Shero said. Hynes coached Wilkes-Barre/Scranton for five seasons. When asked about Hynes's lack of NHL head coaching experience, Shero reminded everyone that Tampa Bay coach Jon Cooper has the Lightning in the Stanley Cup Final against the Chicago Blackhawks only two seasons after being hired away from his AHL job. "I think whether you are 60, 40 or 32, I really believe it is about every coach, no matter what age, it's about earning the respect of the players," Shero said. "That means being a leader, a communicator and a teacher." Hynes said his first goal will be to get to know his players, what they need and what they should expect from him and his vision for the club. "There's differences [coaching in the NHL], but when it comes down to dealing with players, coaching the game, coaching the team, interacting with the guys, I think what goes into winning is across the board, whatever level," Hynes said. "It is connecting with people. It's having solid structure and a plan and trying to maximize the group you have." Hynes almost became an NHL head coach last season, eventually losing the Penguins' top job to Mike Johnston. "My focus was never on trying to get to the National Hockey League, it was a goal at some point, hopefully," he said. "To me it was always concentrate on the job you are in and do the best job you possibly can." Devils forward Stephen Gionta has played against teams coached by Hynes and he was a member of an under-18 United States national team that Hynes served as an assistant coach. "He said he is going to bring some new ideas," Gionta said. "His teams were tough to play against. It's an exciting day for us." The Penguins will receive the Devils' third-round draft choice in 2016 as compensation for Hynes, Shero said. Hynes said Shero told him to just be himself in his new job. "You have to be who you are and what got you here," said Hynes, who had his wife and three daughters sitting front row for his big announcement. "There are obviously adjustments along the way, but you have to stick to who you are and what you do." The Devils have missed the playoff the past three seasons, falling short by 20 points this season with the league's sixth-worst record. Pete DeBoer, who coached the Devils to the Stanley Cup Final in 2012, was fired in December. The Devils finished the season with team president and then-general manager Lou Lamoriello running them with assistant coaches Adam Oates and Scott Stevens. Shero said that Oates and Stevens could be on Hynes' coaching staff but the new coach will need time to consider its makeup. The Devils will have to adjust get younger forwards to play their new style. They are solid in the back with Cory Schneider in goal and a young defence corps that features Adam Larsson, Eric Gelinas, Jon Merrill, Damon Severson and veteran Andy Greene. The forwards are almost all in their 30s, led by 39-year-old Patrik Elias. Shero said he is evaluating the roster. He sees opportunity for players and hopes to increase the competition in training camp.